Nineteen days of solitude. In the conventional sense, though, "days" is a misnomer. You see, Alaska is the land of the midnight sun and in June the sun doesn't ever really set. So, more accurately, it was nineteen days of solitude with no real concept of time. "What time is it?" one would ask. And, without even looking at a watch, without any regard for real time, the canned response would be "it's three o-clock, it's always three o-clock." For nineteen days we were seemingly stuck in the light of day, stuck at three o-clock. As if being in a time warp wasn't enough to throw a person off kilter, we were also in the-middle-of-nowhere, a place so out of the way and so remote that no one really ever ventures there. For that matter, no one even knows where the heck it is. Fortunately, our glacier pilot, Paul, knew of this place and with the finely tuned skills of a senior aviator he flew us there from rural Alaska, from the tiny town of Talkeetna. Talkeetna is a classic Alaskan town known primarily for its fearless bush pilots, glacier pilots, and lots of barking dogs who run loose in the streets. In the shadow of Denali and the surrounding Alaska Range, Talkeetna hosts the tiny airport that launches plane after plane into the rugged Alaska wilderness. Only a few air-taxi services exist, with perhaps a half dozen qualified bush pilots and even less expert glacier pilots. Yet, traffic at the airport is constant with Cessna 185's and Dehaviland Beavers flying almost around the clock. During the long days of late spring and early summer the town bustles with tourists, fisherman and climbers. The fisherman come for the challenge of catching a beautiful trophy fish, tourists come for a glimpse of Denali, "The great one," and climbers come for a shot at summiting the highest peaks in North America. Then there was our party, a motley crew consisting of Mike Glavin, Drew Keegan, Randy Sliester, and myself. We were there to explore no-mans-land, the relatively unknown Revelation Mountains. Truthfully, it wasn't really necessary for us to specify our destination, we could have simply asked our pilot to fill his plane completely full of gas and fly us as far as he could go, leaving just enough gas to get himself back to Talkeetna. Essentially that is what he did. We were flying in one of the biggest bush planes in the world, a single prop Dehaviland Beaver on skis. Capable of transporting a party of four and an enormous load of gear, the Beaver is truly a sport utility vehicle with wings and an extra huge gas tank. In fact, Paul referred to the Beaver as his "truck." Valleys and mountains, then more valleys and mountains, then even more valleys and mountains passed underneath us before we got our first glimpse of the distant range. "You guys are going way out there," Paul said, speaking to us through our headsets. As the big mountains got closer our flight path took on the shape of a winding river. Between massive peaks we skirted through passages that were only obvious at the last minute. Long into our flight and with the gas gauge falling, Paul flew towards a narrow and steeply sided pass; it looked half the width of the plane. As we entered the slot the plane seemed to skim the rock. Then, suddenly, the earth disappeared below us! Nearly 3000 ft. straight down, was the Revelation valley and the dramatic boulder strewn moraine of the Revelation glacier. All around us, sharply chiseled peaks appeared to monitor our flight up the valley, like sentinels guarding enemy intrusion. Our brave pilot continued on. I believe he was yawning as well. The Revelation glacier terminates in a dead end amphitheater, nearly surrounded with 2000 to 3000 ft. walls. Considering the risk, 99.9% of professional pilots would consider landing on the Revelation glacier to be utterly suicidal. Once the pilot reduces his altitude into the shadows of the deep cirque, there is simply no turning back and no escape. Wonderful place for a base camp. Both calculating and cavalier, Paul's landing on the glacier was a textbook perfect maneuver, despite the fact that no aviation school teaches such a thing or even endorses such a stunt. After shutting the plane down, Paul jumped out onto the glacier in his flip-flops. What a hero! If John Wayne had flew bush planes I'm certain he'd have worn flip-flops too. Copious gear, our entire life-support system, was unloaded from the plane and piled on the glacier in a big mound. As Paul climbed back into the cockpit he casually stated "I'll see you guys in a few weeks." Paul took off and as prop noise faded and the plane slowly disappeared I realized that our link to the outside world was gone. All the familiar noises that I'd become so accustomed to gave way to utter silence, an eerie silence like I have never experienced before, I stood there thinking - in the Revelation Mountains no one can hear you scream. No, it wasn't outer space but it sure felt like it. Everything in sight was staggering in terms of height and distance, we later referred to this as the "Revelation factor," defined as the skewed perception of time, height, and distance. I felt diminutive in the presence of such a vast place. All around us there were innumerable granite walls and spires all higher and more enormous than I have ever seen. It was so real it was unreal, like I walked into the foreground of a painted landscape. In a state of hypnosis, I barely heard the voice speaking to me. After repeating himself, Glavin had my attention as he posed the question, "do you think Paul's going to come back and get us?" Next month, part two - "House sized boulders and Garlic Fry Bread." About the picture. 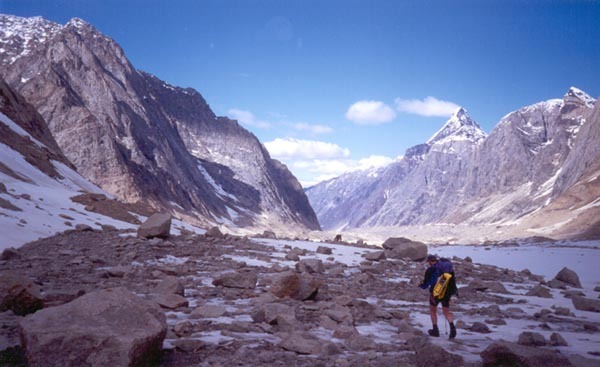 It's Glavin in the photo, walking away, down the moraine on the Revelation glacier. The pointy peak in the background is Mt. Hesperus. It's only been climbed once, apparently, but attempted a few times. The cloud trailing from the summit was almost always there, in one form or another, even on perfectly sunny days. Kinda weird but true. When you see the photo, imagine this... the view you're looking at has only been seen by a handful of people, literally. That was the most amazing thing about being there, just looking around and knowing that.